If you’re in or around the Chicago area right now, you may have noticed the significant drop in the temperature lately. With no end in sight for the cold weather, the thought of trading in a rough Midwest winter for a more warm environment has never been more alluring. One idea might be to embark on a road trip. There’s a variety of destinations to consider, but one of the most popular destinations for any traveler is without a doubt Las Vegas, Nevada. Providing world-class entertainment as well as beautiful weather throughout the year, Las Vegas is a city that must be experienced, making it the ultimate destination. Plus, it gives you a great excuse to also spend some time in Arizona and check out some of the great 55+ communities you'll find there. Turn this vacation into a scouting trip as well. 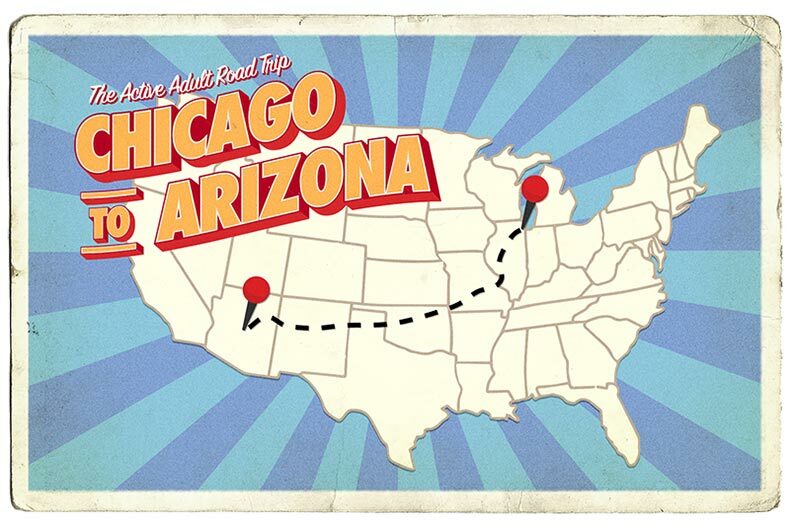 In terms of driving, a straight route from Chicago to Arizona is roughly 1,750 miles and will take an estimated 26 hours to get there if you go nonstop. But where’s the fun in that? Like any good road trip, there’ll be plenty to see and do along the way so be sure to give extra time to make the most out of your trip. Below, we’ve listed worthwhile detours that are worth checking out along the way. There's no better place to start your trip to the west than the Gateway Arch. 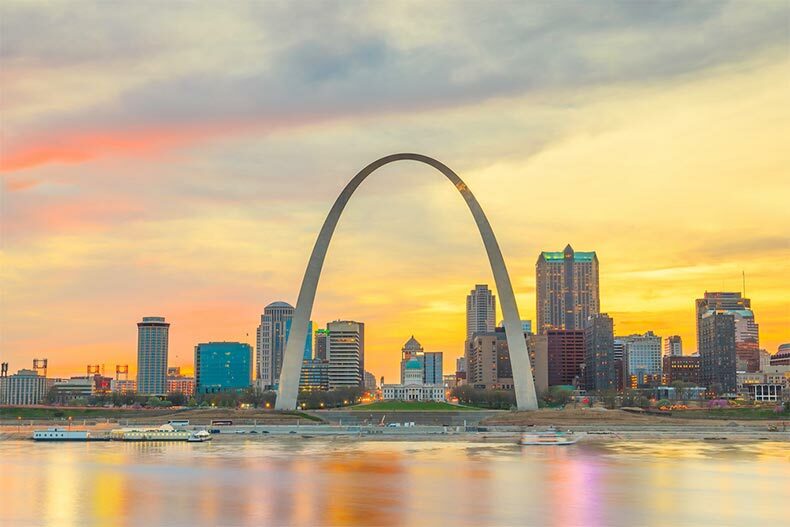 The first major stop to check out is the iconic Gateway Arch in St. Louis. Standing at an impressive 630 feet, The Gateway Arch has long been a popular destination thanks to its unique look as well as the unmatched view of the city that visitors can only experience from the very top. But the perks don’t end there. Inside also includes a number of historically significant exhibits that highlight America’s period of Western Expansion as well as the long-studied journey of Lewis and Clark. While history enthusiasts will find much to like from visiting The Gateway Arch, there’s also plenty to explore nearby. This includes the Missouri History Museum and the Museum of Transportation. If history isn’t your thing, rest assured there’s much more to do around the city, especially for sports fans. If you’re visiting during the spring or summer, a visit to a Cardinals game is absolutely mandatory. St. Louis has long taken pride in its many sports teams, treating its players as local heroes. As such, there’s no better way to embrace the spirit of St. Louis and its charm than by putting on some red and cheering along the city’s beloved baseball team. The next spot to check out is Oklahoma City. The largest city in the Sooner State, Oklahoma City is filled with western charm. No place in the city attests to that better than the National Cowboy & Western Heritage Museum. Visitors have flocked to the museum in order to both learn about the country’s rich history, as well as to see the popular Buffalo Bill statue that sits on the grounds. Hailed as the man who truly embodied the spirit of the west, no road trip out west would be complete without seeing for yourself the large tribute. One of the most notable restaurants in the city is Cattleman’s Steakhouse. The oldest continuously operating restaurant in the city, Cattleman’s has been a popular eatery for more than a hundred years. The establishment has attracted a number of famous figures over the years, including President Ronald Reagan and President George W. Bush. Following your adventures in Oklahoma, the next stop is in Phoenix, Arizona. Phoenix has always been a popular town thanks to its great location and climate. The city alone provides 189 parks to explore, making up over 33,000 acres of land. Some of the many activities to check out include hiking, camping, climbing, and horseback riding. But there are even more fun outdoor activities just outside the city. Some of the many outdoor activities you can sign up for include a guided tour of the Arizona Desert through ATVs as well as the chance to go up in the air and see the vastness of the region through a hot-air balloon. Of course, Phoenix is only an introduction to Arizona’s unparalleled beauty. To see its full beauty, you’ll have to take one final detour. And of course, while you're here, it's a great spot to explore active adult communities. From the original itself, Sun City, to newer construction, such as Trilogy at Vistancia, there are so many options available to you within an hour's drive. After Phoenix, head north until you hit the city of Prescott. This Northern Arizona region is often referred to as Everybody's Hometown because retirees often find something here that reminds them of where they grew up. Depending on when you arrive, you'll probably run into a festival or event, such as Frontier Day, The World's Oldest Rodeo, the Bluegrass Festival, Tsunami on the Square, or the World's Largest Gingerbread Village. It's also a good place to look around at 55+ communities, especially if you're looking for a slower-paced lifestyle and cooler temperatures. Unlike the larger retirement destinations of Phoenix and Tucson, Prescott does not have an abundance of large-scale active adult communities but there are several age-restricted communities. Stop for some natural splendor at the Grand Canyon before finishing in Vegas. From there just keep heading north until you hit the Grand Canyon. You can't miss it, it's one of the seven natural wonders of the world. 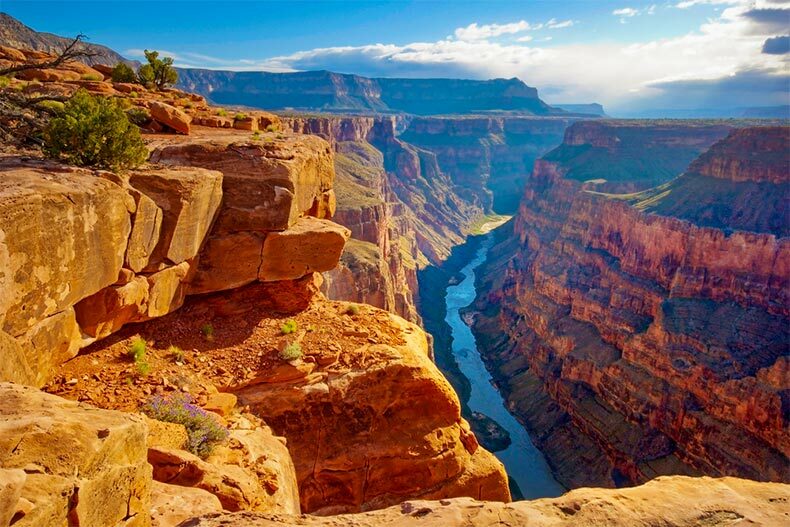 A natural marvel, the Grand Canyon is 277 miles in length and attracts millions of visitors each year who come from all over the world to observe its grandeur. To say the Grand Canyon is rich in history is an understatement. To give you an idea, there are rocks within the canyon that date to over two billion years old. It is a place that no picture or video can do true justice. It's also a place that every person needs to see at least once in their lifetime. You've made it this far, so now it's time to end the trip with a whole lot of fun. You have finally reached Las Vegas. Over the years, Las Vegas has earned recognition as a high-end location that offers its inhabitants nothing else but world-class entertainment and dining. Some of the many places to check out while here includes the famous Las Vegas Strip, which is filled with shops and restaurants, and Fremont Street. Of course, nobody goes to Vegas if they’re not feeling a bit lucky. After a long road trip, a great way to unwind and celebrate is to check out the many extravagant casinos and resorts found throughout the city. From the MGM Grand to Caesars Palace, Las Vegas has everything you’ll need to finish your trip in style and luxury.